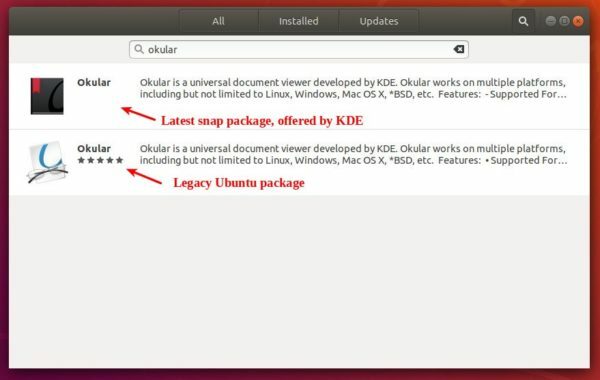 KDE Okular document viewer now can be easily installed in Ubuntu 16.04, Ubuntu 18.04, and higher via the snap package. Okular is a universal document viewer developed by KDE. It supports PDF, PS, Tiff, CHM, DjVu, Images, DVI, XPS, ODT, Fiction Book, Comic Book, Plucker, EPub, Fax. It features annotations support, sidebar with contents, thumbnails, reviews and bookmarks. Okular snap is a containerized software package offered by KDE. It bundles all required libraries and auto-updates itself. Once installed, launch it from software menu and enjoy! I installed it on Ubuntu Mate 18.10 without installing “kde-frameworks-5-core18” first and had no problem. Snap will automatically install it when you install okular. Thank you man. I failed to install it on first try, and I thought it was the dependency issue.